It seems that the Cascade Brewery is serious about bringing 'Green Beer' to the world with the release of 'Cascade Green' a preservative free, as well as low-carb and carbon neutral to boot. Oh, and by the way it doesn't taste too bad either if you happen to be a beer drinker. The Cascade Brewery is based in Tasmania and prides itself on using locally-found ingredients and aiming to make the production process as environmentally friendly as possible. You can read more about their efforts at the Cascade Green Website. 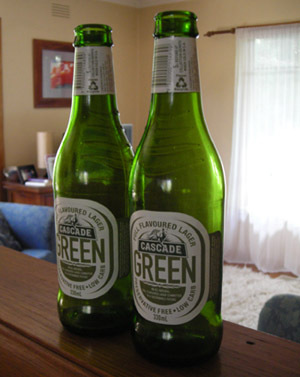 Cascade has reduced its water usage and greenhouse gas emissions over the last six years through the implementation of its environmental sustainability program.Cascade Green goes the extra step with carbon offsets so that the full lifecycle of the greenhouse emissions associated with the production of the beer is accounted for. Go out and buy some, because the taste is really the only true test of a great beer!